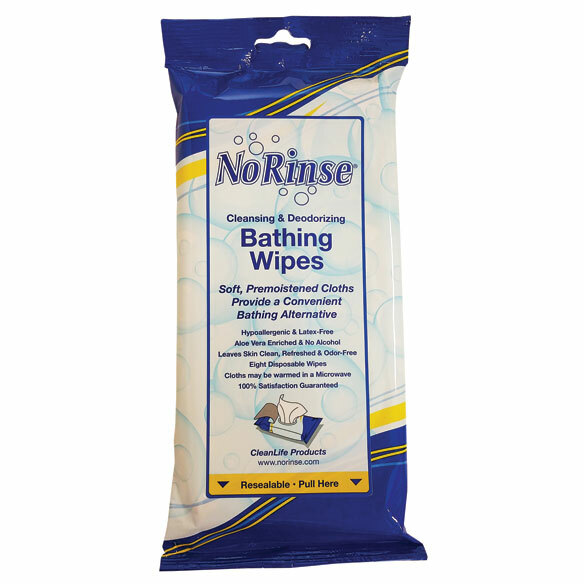 Hypoallergenic, latex-free no rinse bathing wipes clean and deodorize skin when a regular bath/shower isn't possible. Warm bath wipes in microwave as directed and check temperature before use. Alcohol-free; aloe and lanolin soothe skin. Each package has eight 8" x 8" no rinse wipes for head-to-toe bathing. No time to shower, use these convenient bathing wipes and you'll feel refreshed. Easy, take along package - heat in the microwave, no mess. They are wonderful for people who are bed-ridden - a nice way to keep them clean and refreshed. Excellent product .Leave your skin clean and refreshed. we were on family trip, they are there and ready on the spot, no water needed. There are no reason that arent't great about them. They are the best thing that has come along that I can think of. Fantastic product for people who need a quick wash without water and takes only 2 minutes. The No Rinse brand is far superior to the "ReadyBath" product sold for $1.00 less. Go for the extra buck ... well worth it. After two major surgeries when I was unable to shower for some time, I found these and now recommend them highly to a wheelchair bound relative who relies on 3 weekly visits from a nurse for his personal cleanliness. I found this product to be so refreshing and easy to use that I keep them on hand all the time. Feeling fresh when disabled or temporarily ill, lifts the spirits tremendously. These bathing wipes work great. Leaves you feeling very refreshed. Fair price. Used after surgery when not allowed to take shower or bath. A product I can use to make bathing easier. Efficient, convenient and easy to use. I like this item a lot. These wipes are a quick and easy way to freshen up on a hot day. I can't live without them in the summer months. My sister used your company. i like the personal items. Can't take showers at present. I keep bathing wipes on hand all the time. i read that these were preferred over the "ready bath" cloths. i decided to try them to see if they were better. i am waiting for my shower to be made a little easier for me so i will use these in the meantime. I have used this type of product in the hospital and really liked them. Good for when I can’t always shower since I cannot get into the shower on my own. Does a good job, easy to use and stores well. They're very moist and one can be used to clean the entire body. Easy on my skin. I am having back surgery, I won’t be able to shower right away. To help my father stay fresh between regular bathing. For an occasional freshen up without having to get in the tub. I already have bought this and love them. First used them in hospital when I had a total hip replacement. First time sale but like the site. I have a water shortage but I want to feel clean and refreshing..No Rinse Bathing wipes helps me to stay cleaqn and fresh smelling.Easy and quick way to clean my body and feel refreshed. How many per package, please? BEST ANSWER: There are 8 to a package but they are quite large and thick. I kept a package by my easy chair and my visiting nurse used one to clean my feet when she came to do wound care. 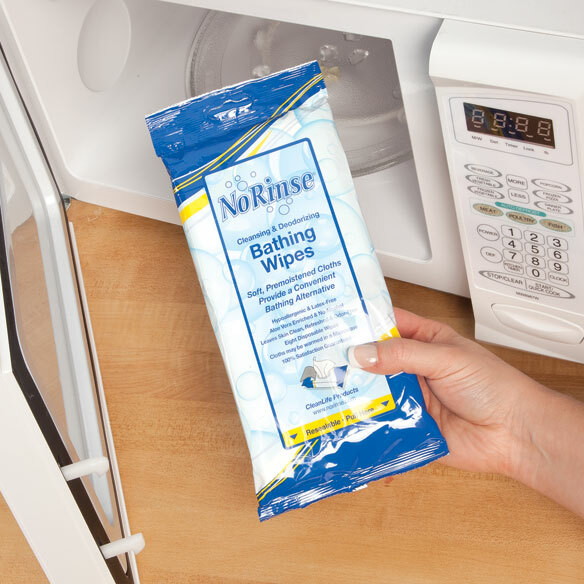 This was very convenient - no water, no wet washcloth, just throw out the No Rinse wipe with the rest of the garbage. BEST ANSWER: Thank you for your question. Active ingredients is Benazlkonium Chloride. The inactive ingredients are Allantoin, Aloe Barbadensis Leaf Juice, Citric Acide, Cocamidopropyl PH-Dimonium Chloride Phosphate, Disodium Edta, Fragrance, Linoleamidopropyl PG-Dimonium Chloride Phosphate, Polysorbate 20, Purified Water, and Sodium BenzoateWe hope this information will be of help to you.